This entry was posted in Rides on June 23, 2018 by cfprideleader. The group has been letting the train take the strain. 8th June, Colchester to Walton then ride to Clacton and back to Walton. 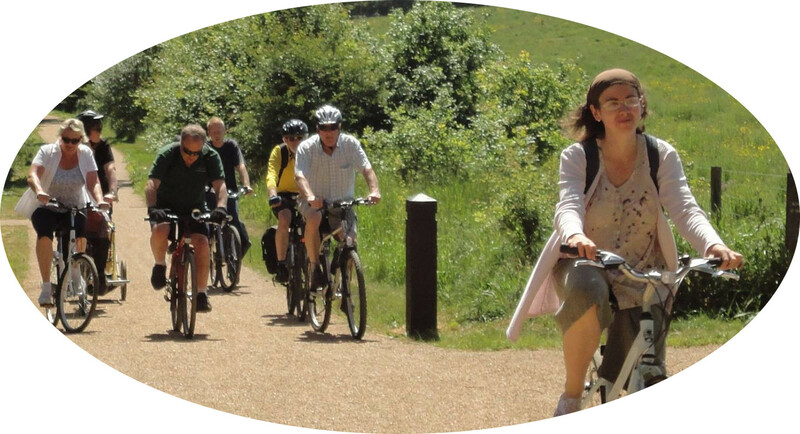 15th June, Colchester to Braintree via Witham the a ride on the Fitch route, returning same way. 22nd June, Ride to Sudbury stoping at Recycle for refreshment and a look at the bikes for sale, onto Bures for lunch where Alan joined us as did Beth and Ian who road with us continuing to the Cycle Cafe and Pub at Sudbury for Ice-cream, returning via train to Marks Tey. One thing I have learnt 2 single tickets Sudbury to Marks they are £4.75 each, one member only had cash and the machine was not taking cash so I bought a 3 tickets, 3 tickets is classed at a group with 34% discount so 3 tickets are £3.10 each and therefor it is cheaper for 2 people to buy 3 tickets, what a wonderful country we live in so logical. I am going to do some further checks in future we will buy group tickets. Next Friday 29th a pub in Manningtree. I am behind this week as I have been away. Wednesday you have a choice, long ride to Fillpots or a shorter ride to The Cafe near Andy’s. Fridays ride is to Sudbury return by rail if it is running, we will lunch in Bures and have afternoon tea in Sudbury. Please come prepared with plenty to drink and suitable clothing. The Summer Picnic will be on the 11th July and I propose the ride to Heybridge Basin on the 3rd August. This entry was posted in Rides on June 19, 2018 by cfprideleader. It is doubtful that I will be out this Friday, Jon has spent a considerable amount of time and research on the following ride for which I thank him. As there is isn’t a club ride on Friday 8th June a small group of us have organised a ride along the coast from Walton on the Naze to Clacton. We’ll be travelling from Colchester to Walton on the Naze by train and returning by train. The details are below and anyone is welcome to join us. A group of us are joining at Hythe but if you’re joining from one of the earlier stops then please give a wave when you get to Hythe so we know which carriage you’re in. The train arrives Walton on the Naze at 11:49. From the Walton on the Naze station we’ll ride north to the Naze, but we’ll not be stopping. We’ll then do a u-turn and ride south down the coast to just past Clacton stopping for lunch at the Greenswald Cafe for about 40 minutes. We should arrive for lunch about 13:10. Then it’s another u-turn and a ride north back up the coast to Walton on the Naze station. We’ll try to cycle along the promenade as much as possible but may have to adjust plans depending on how busy it it is. The distance is about 18 miles. Click here for the route. An Off-Peak Day Return ticket from Colchester North is £9.40 and Hythe is £9.20. The return trains from Walton on the Naze run hourly. So that we can have a leisurely lunch and not miss the 15.00 return, we need maintain an average speed of at least 7.5 mph, which should be be OK for the Friday group. I’ll keep an eye on progress and we may have to adjust the lunch time stop accordingly. This is just a group of us riding together and although I’m happy to be in front I am not a qualified ride leader and I’ll not be taking that role and any associated responsibilities, so you’ll be responsible for your own safety. This entry was posted in Rides on June 6, 2018 by cfprideleader. A Big thanks to Richard Monk for stepping in and taking todays ride to The Bricklayers as there was doubt I would make todays ride. Richard took us through the nature reserve and up the much improved Bakers Lane. The Bricklayers beer is as good as it was, food not bad but not as extensive a menu, bike racks still there. A good turnout today, Beth and Ian Hart joined us from Canada. Last Wednesdays ride to The Musket Club was a classic case of why a ride leader should recky a route, it was closed for half term. We met Alan there and headed to the Roman Circus Cafe where again we met Alan. I have suggested that I try and ride front Tandem with Alan soon, I prefer black grapes. Richard Monk will take the group out this Wednesday, Claire is having a cataract done and I may have to act nurse. Next week Roy will take the group to Wivenhoe. Friday we headed to Abberton as usual a good ride. The group has come of age, I will not be out the next two weeks and they have decided among themselves to either take the train from St Botolphs to Walton or Frinton and cycle the coastal route to Clacton returning by train. Watch this space for more details if you wish to go turnout as usual at 10:15 for 10:30. This entry was posted in Rides on June 5, 2018 by cfprideleader.